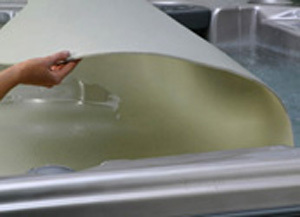 Gladon’s Spa CoverSaver is designed to float on the surface of the water in your spa. The CoverSaver protects your expensive spa cover from the chemicals in your spa water, extending cover life. At the same time it reduces water evaporation and the loss of spa chemicals. The CoverSaver works with your main cover to limit heat loss, saving expensive energy. Our Spa CoverSaver can reduce heat loss by up to 80%, compared to an uncovered spa. The CoverSaver is made from a closed cell insulating foam, bonded to an impervious layer of an advanced polymer material. This unique composition resists the absorption of moisture and chemicals. Compared to "bubble wrap" material, the CoverSaver will last longer while insulating better. The Spa CoverSaver can easily be trimmed to fit any spa shape. Available in 3 convenient sizes to fit most spas. This item ships directly from the manufacturer. Please allow an extra 3 days for delivery.